This multi-purpose electric iron kit consists of a basic 80 watt Weller soldering iron, 4 burn-in knives, an action part heating attachment, a key bushing tip and a hammer iron, together with an iron rest. The burn-in knives are made of aluminum and are all 3-1/2" in overall length. The four different blade shapes allow for any type of burn-in project. The "V" shaped aluminum heating attachment has a 1/2" wide gap that can be placed around any piano action part that requires heat for bending or loosening glue joints. The key bushing tip is 1/8" thick and 3/8" wide, and is used to heat and remove key bushing cloth. The last attachment, the brass hammer iron is used for ironing felt hammer heads. 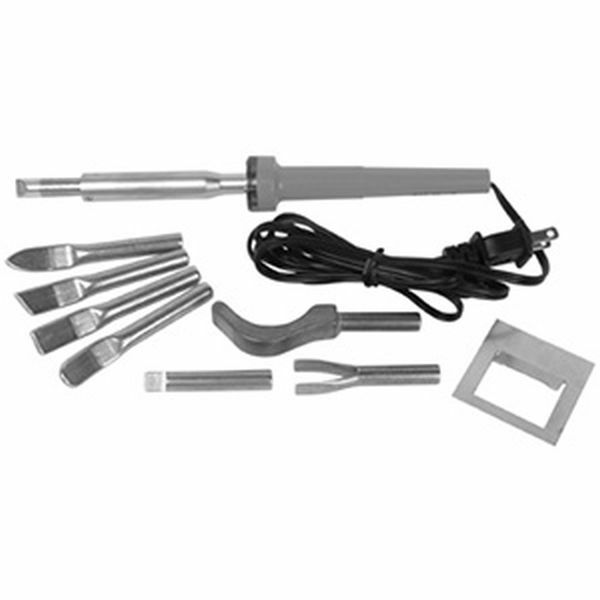 Rather than buying each of the above tools separately, this 5-in-1 Kit is an economical and functional package for all piano technicians.